In a contemporary, yet classic survival story, The Martian by Andy Weir documents the struggle of astronaut Mark Watney to withstand a barrage of life-ending threats thrown by Mars. The Martian is a combination of Tom Hanks' Apollo 13 and Castaway. With in-depth scientific analysis, from physics and astronomy to chemistry, botany, and geology, Weir's book grabs both the mind and soul. A few weeks ago, students in my First Year Seminar course on the Search for Intelligent Life in the Universe at High Point University read The Martian. The purpose of our course is to investigate the question "Are we alone in the Universe?" 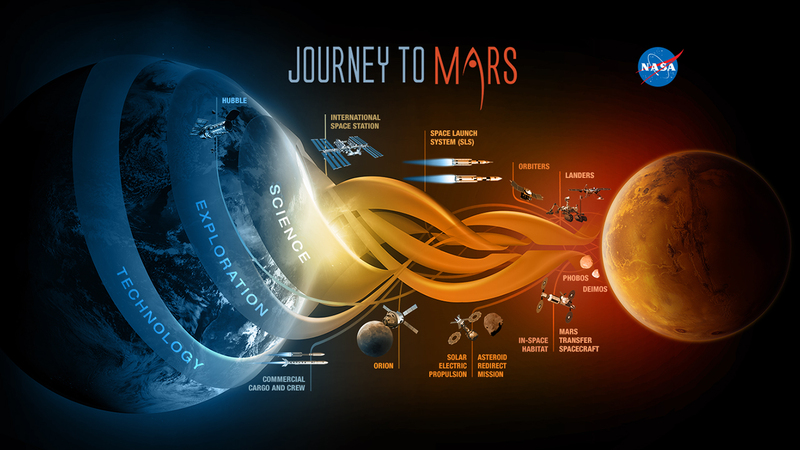 In terms of the search for biological life, there's no better place to start than Mars. But if you are searching for a fun way to learn science, there's no better place to start than The Martian. Tomorrow, the The Martian will be released as a film starring Matt Damon. With the release of the film and the recent finding by NASA that water flows on present-day Mars, interest in Mars is at an all-time high, making it a great excuse to talk about physics. Let's begin with the length of a day on Mars -- a sol. While on Mars, astronaut Mark Watney organizes his log (or journal) by sol. A sol is an abbreviation for solar day. If Watney starts a stopwatch at the moment the Sun is highest in the sky (noon) and stops the stopwatch the next time the Sun is highest in the sky, the reading on his stopwatch is one solar day. A solar day is NOT the time required for a planet to rotate once on its axis relative to the background stars--this is called a sidereal day. To understand the difference between solar day and sidereal day, let's begin with Mercury. It takes 88 days (i.e. Earth days) for Mercury to complete one orbit around the Sun. This is a Mercurian year. How long is a solar day on Mercury? In the GlowScript simulation below, the arrow represents an observer on Mercury at the equator. (The simulation assumes a circular orbit and no tilt of Mercury's axis of rotation.) Click the 3D scene to start the simulation. A solar day is the time required for the arrow on Mercury, initially pointing toward the Sun, to point toward the Sun again. In the simulation, this requires two entire orbits, or two Mercurian years! On Mercury, one solar day is equal to two years. Thus, it is daytime for one year and nighttime for one year. The side of Mercury facing away from the Sun gets very cold because it receives no sunlight for an entire year. This is one reason Watney is not making plans to go to Mercury. Here is a GlowScript simulation of Venus. How long is a solar day on Venus? (Click the Run button below the scene to start the simulation.) The arrow is initially pointing at the Sun at t=0. Stop the simulation when the arrow points toward the Sun again. How many days elapsed? You should notice it is about 117 days. A solar day on Venus is a little more than half a Venusian year. Did you notice anything else about Venus? It rotates clockwise about its axis as it orbits counterclockwise about the Sun. It is the only planet in our Solar System to do this. Mars rotates about its axis much faster than Mercury or Venus. As a result, we will have to slow down the simulation. In this GlowScript simulation of Mars, the time step is only one minute. This is necessary if we are going to precisely measure a solar day. To begin, click the Run button below the simulation. To help you measure a solar day, the simulation pauses after one rotation relative to the background stars (a sidereal day). Click the scene (not the button) to continue the simulation. Then it pauses when the arrow is pointing directly toward the Sun again (a solar day). Notice that a solar day on Mars is 1 day, 40 min. It's 40 minutes longer than a (solar) day on Earth. That's not much, but when Mark Watney is gone for 549 sols, that's 564 days on Earth. To learn the physics and programming behind the simulations, check out the textbook Matter and Interactions by Ruth Chabay and Bruce Sherwood and the programming language (and package) VPython and GlowScript. The book Matter and Interactions is an introductory calculus-based physics textbook that brings atomic and molecular applications and computational modeling to the introductory physics course. Here are bookmarks to lecture demo programs for the textbook Matter & Interactions by Ruth Chabay and Bruce Sherwood. 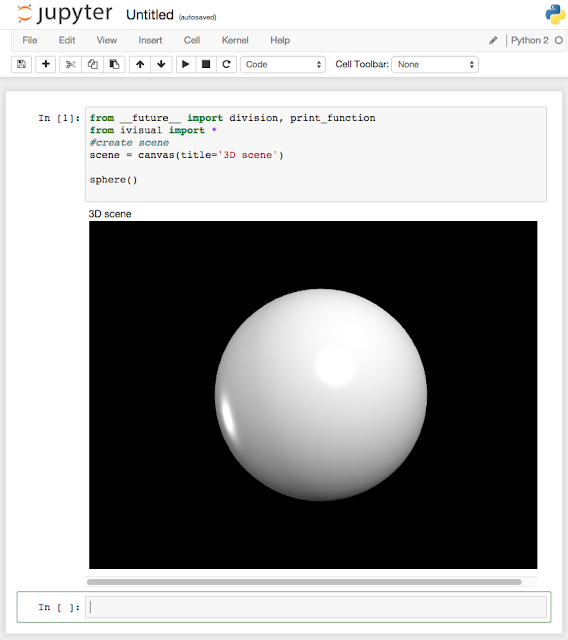 In a previous post, I described how to install and run VPython using iPython Notebook. However, the previous instructions are now outdated due to the upgrade of Notebook to Jupyter. The instructions below are for Jupyter. The Jupyter home screen will open in your browser. The header of the page is shown below. 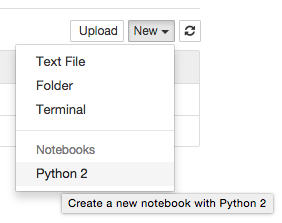 Click the "New" menu and select "Python 2" as shown below. You will see a header for the new Jupyter notebook as shown below. Type the following program into the first cell. You will see a VPython scene with a white sphere as shown below.